India is a vast South Asian country with diverse terrain and is the seventh-largest country by area, the second-most populous country with over 1.2 billion people, and the most populous democracy in the world. Bounded by the Indian Ocean on the south, the Arabian Sea on the south-west, and the Bay of Bengal on the south-east, it shares land borders with Pakistan to the west; China, Nepal, and Bhutan to the north-east; and Myanmar (Burma) and Bangladesh to the east. Home to the ancient Indus Valley Civilisation and a region of historic trade routes and vast empires, the Indian subcontinent was identified with its commercial and cultural wealth for much of its long history. Since its independence in 1947, the country has maintained cordial relations with most nations. In the 1950s, it strongly supported decolonisation in Africa and Asia and played a lead role in the Non-Aligned Movement. Economists estimate India to have been the largest economy by GDP throughout the 1st millennium CE, accounting for a third of the world economy. 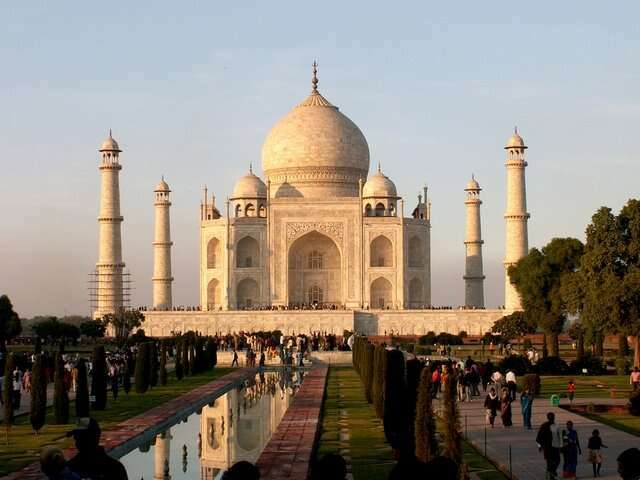 Much of Indian architecture, including the Taj Mahal, other works of Mughal architecture, and South Indian architecture, blends ancient local traditions with imported styles. Vernacular architecture is also highly regional in it flavours.